At Sign Partners we custom fabricate any type of lobby sign to display your company name in your lobby, reception or showroom. We can incorporate your company branding into the sign and make sure it blends in naturally with your interior design. It might not be an easy decision to select the perfect lobby sign and therefore we guide you through this process in 4 simple steps. Upon receiving your request for a lobby sign our experts will visit the actual location of the new sign. We study your logo together with the existing interior design and make a proposal. If you do not have a logo for your company yet, our graphic designers can design a custom logo for you. While visiting your location we show you some samples and discuss together the direction you wish to go. Lobby signs are constructed from an assortment of materials, with limitless possibilities. Some of the more commonly used materials are brushed aluminum, acrylic, pvc and metals. Depending on which materials are used when fabricating a lobby sign, they can be very affordable, or extremely high-end. After taking a decision on the actual material of your lobby sign we make a custom design for your lobby sign. We can either use your existing logo or make a proposal for custom lettering. Some ideas to enhance your lobby sign are to include your tagline, your services, established date etc. Our Graphic Designers make sure that you are completely satisfied with the design before proceeding to the next step. As described earlier, Sign Partners uses your existing logo with it’s original colors and we make sure that your lobby sign blends in with your interior design. Therefore the most important step of selecting your lobby sign is color management, which is often overlooked. Colors react different on each material and therefore our experts make sure that the color of the lobby sign is exactly the same as it is on your website, your stationary, business cards and so on. Do not forget that each computer monitor shows colors different and therefore we are more then happy to calibrate your monitor if need to. Sign Partners takes care of the production of your lobby sign according to your approved custom design. When installing your lobby sign there are different ways to install, which we discuss with you in detail. Considering that you are running a successful business we do not want to disturb your operation and therefore we are flexible to schedule your preferred date and time of the installation. Another detail to consider is that if you are ever moving your office you are able to take your lobby sign with you, so we keep this in mind during the installation. 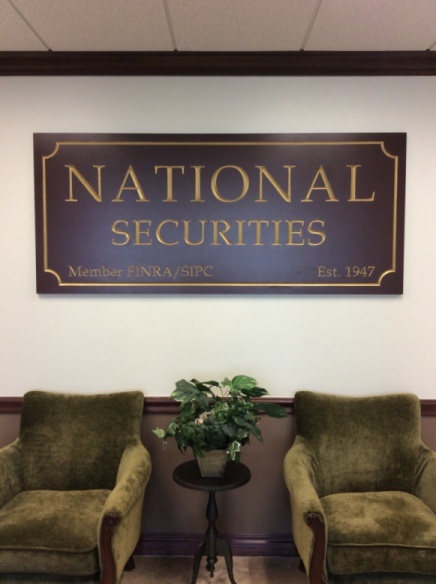 Recently we have worked with National Securities in Boca Raton for their brand new lobby sign. They were looking for a wooden lobby sign, matching the interior wood accents of their reception area. In the picture above you can see the end result. Looking for a new lobby sign to enhance your branding and customer experience? Contact us at Sign Partners and we are delighted to visit you and guide you through the process.